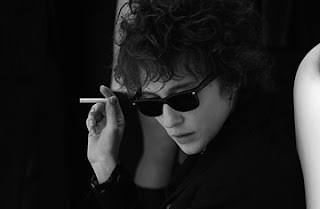 A film I am looking forward to seeing is Todd Haynes' "I'm Not There: Deconstructing Dylan"
I think Bob Dylan is a true institution and I would watch any film that had anything to do with him. However, another reason why I cannot wait to watch this new film is the fact that Cate Blanchett is one of the six actors who portrays Dylan. Even though Richard Schickel gave Haynes' film a stingy review on the NY Times, I will still see it. After all, it's not every day that the very talented Cate Blanchett plays a man on the silver screen. I'm sure she will be more convincing than Julie Andrews in Victor/Victoria. cool title. i'll stay away from the reviews then. if kate b. 's in it, that'd good enough for me. how's that for hero worship? loved her in Elizabeth, of course. when is this coming out? Kate Blanchett is usually very good. One of her best performance, in my opinion, is her dual role in Coffee & Cigarettes. I think the release date depends on the city one's in. Right. I read that too. I still want to see it though. Few people liked Martin Brest's Meet Joe Black but that didn't stop it from being one of my all-time favorite films!